Princess Diana of Themyscira in the heat of battle! Super-detailed 11 4/5-inch tall polystone statue. Based on the blockbuster Wonder Woman movie. Based on the blockbuster Wonder Woman movie, this super-detailed Wonder Woman Movie Wonder Woman 1:10 Scale Deluxe Statue from Iron Studios is a must for DC Comics and Wonder Woman fans. 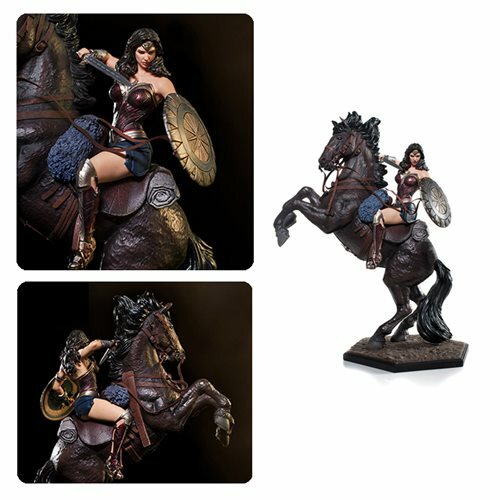 Made of polystone and hand painted, the magnificent piece measures about 11 4/5-inches tall and presents Princess Diana of Themyscira on horseback, in the heat of battle. Ages 15 and up.